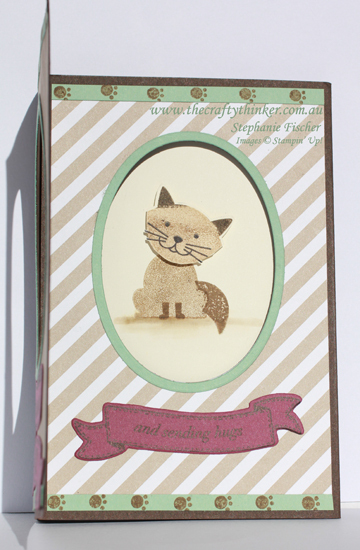 It was my son's birthday recently and since he loves cats I decided to try out my new Foxy Friends stamp set. I made the card with a piece of Early Espresso cardstock measuring 6" x 12", scored on the long side at 4" and 8". For the front of the card, I cut a piece of Crumb Cake cardstock to 3.75" x 5.75" and used Versamark and the Diagonal Stripe background stamp to create the diagonal lines. 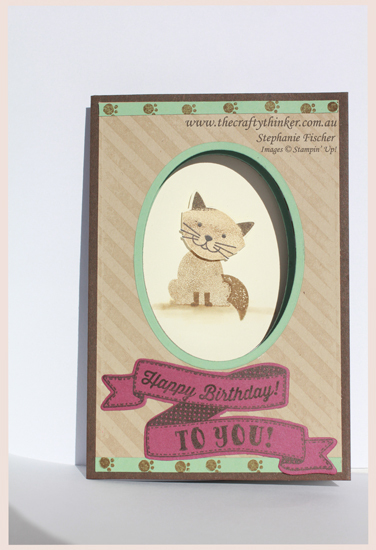 I adhered that piece to the front of the card and then used the second largest Layering Ovals Framelit to cut a window. I'm struggling to adapt to the winter light for my photographs! I cut a piece of Crumb Cake DSP (from the Neutrals DSP Stack) to 3.75" x 5.75" and adhered that to the next piece of the card. 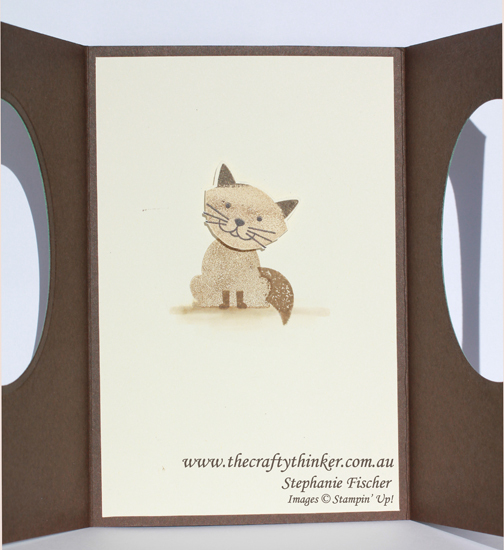 I refolded the card and used a pencil to lightly draw around the inside of the aperture in the front of the card. I used the pencil marks to line up the same die to cut a window in this layer. I then used the same oval die and the largest oval die to cut two frames from Mint Macaron cardstock and glued them in place. I cut a piece of Very Vanilla cardstock to 3.75" x 5.75" and temporarily positioned it on the middle section while I made a very light mark through the "window" to help me line up the stamped image. I then stamped the body of the cat using Soft Suede ink (stamped off). I masked the body and stamped the tail with Soft Suede ink. I only half inked the legs because cats have shorter legs than foxes! I inked up the head with Soft Suede ink and stamped off once, then I tapped jusst the ears into Early Espresso ink and stamped the image on a scrap piece of Very Vanilla cardstock. I added the face stamped in Basic Black and then punched out the head. I trimmed back to the ink line on the bottom half of the head with snips and then stuck the head to the body with a dimensional. I used Birthday Banners bundle and Banners For You Bundle using Early Espresso ink and Rich Razzleberry cardstock for the front of the card. I also cut thin strips of Mint Macaron and stamped the paw print from Foxy Friends with Early Espresso ink and stuck them to the top and bottom of both flaps of the card. The banner on the inside flap of the card uses the Birthday Banners and matching framelit and a sentiment from Feather Together. I just picked up a little Soft Suede ink with an aqua painter to add a little shadow to "ground" the cat.